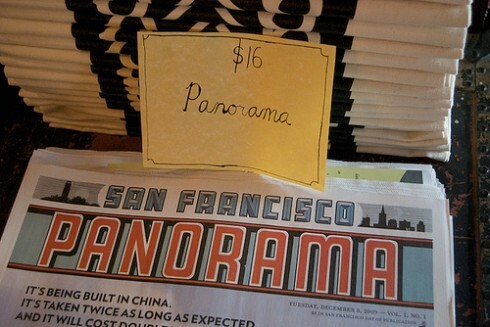 Last week, McSweeney’s published their gorgeous, 320-page, one-shot newspaper, the San Francisco Panorama. We have not yet gotten our hands on one, here on the other coast, but the reports were all glowing, from the feature in the LA Times to the New York Times live-blogging its distribution. “The Panorama,” McSweeney’s honcho Dave Eggers emailed the Times, “is just a reminder that readers will be more likely to pay for the physical paper if they’re given something very different than what we get on the Internet.” The Panorama said its total editorial costs were $80,000, which is almost exactly one-third of the total production costs. It cost $111,000 just to print 23,000 issues; the total cost, of each issue, including editorial, was $7.98. The production time was about nine months. There were seven full-time staff members, and it was published by Oscar Villalon, the former editor of the San Francisco Chronicle’s book section, who took that newspaper’s buyout last fall. The income from the sale of the paper is hard to estimate. It was selling for $16 at bookstores and $5 on the street. Reports said that the original run of 20,000 was “sold out in 90 minutes.” Bookstores generally only had a stockpile of 200 or fewer; we presume the majority were sold on the street. The 3000 additional copies, intended for national distribution, were immediately sold. A second print run has been ordered, of an unknown amount, to arrive in January. The paper’s advertising income was $61,000. That is $2.65 in income per issue from advertising. That means that, at a price of $5 for 23,000 issues, the newspaper would have taken a loss of 33 cents. Presumably, the people who purchased the newspaper at the $16 cost boosted it into profitability. What was the intention? “The hope is that we can demonstrate that if you rework the newspaper model a bit, it can not only survive, but actually thrive,” is what Eggers wrote in his mass email, way back in June, to all concerned about the fate of print. But what’s curious about these numbers is that they are magical. The total editorial costs were $80,000. There were seven full-time staff members-although the publisher, Villalon, we understand, only began work there in September. You can divide $80,000 pretty much any way you like and not find a way to make this make sense. There were 218 contributors. So say everyone-everyone, from William T. Vollman to Stephen King-got paid $250 (to use a nice round number) for their contributions, whether it was a drawing or a 10,000 word piece of reportage. (That may not be a terrible average-although that rate, for a 10,000-word piece, works out to be a payment of $1200.) That’s $54,500. But some of those 218 contributors were artists. Another way to look at it: overall, the paper contains very roughly 350,000 words: that would be $42,000 at 12 cents a word. At that average-per-piece, which is presumably pretty low, that leaves a bit more than $38,000 for the seven full-time staff members (and, as the paper notes, copy-editing, equipment and “one lamb”). Except, there was for illustrations a total budget of $15,000. This leaves a maximum of $23,000 for the staff, who would have been paid $3200 each for their labors. This means that, if the publisher worked on the paper for four months, and the remaining money were divided equitably, and none of the other dozens of people working part-time were paid at all, he would have been taking home $800 a month. Photograph by Steve Rhodes, from his excellent set of images of the paper.